We take rope for granted and by we I mean modern Western-type people. We don’t need rope very often in our daily lives and when we do, we know right where to get it. Then we are often surprised at how expensive good rope can be. That’s because cheaply made rope is pretty much worthless. 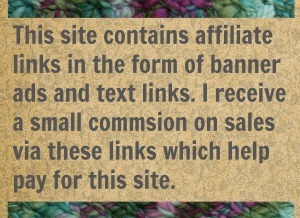 We, the yarn-obsessed crafters, should be able to understand that because rope is really just yarn. A twisted rope is big, industrial-grade, yarn. Knowing that, I have been able to justify browsing through the history of rope making instead of doing something productive (like some much needed housecleaning). So let’s talk rope and you can avoid doing productive things for a while as well. I could spin that… if I had a spinning wheel the size of a semi-truck and team of football players to help me work it. Which is to say that of course I could never, ever spin that in the normal way. But it is just yarn and men did spin it. They didn’t have wheels though. They had rope walks. But before we take a look into rope walks, which most major cities used to have, lets go gerrymandering into the history of ancient rope. After all I’m trying to keep you from those dull and productive things you need to do for as long as possible. 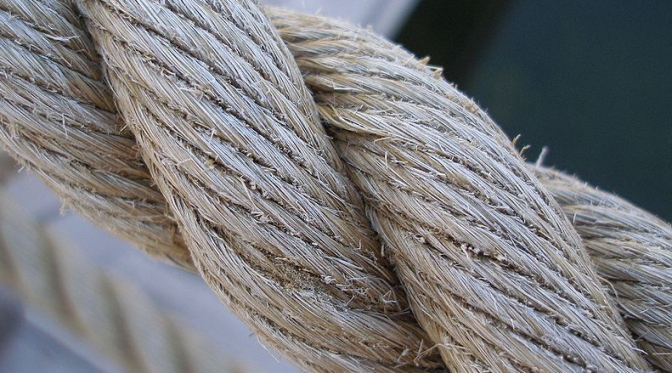 The oldest evidence of rope is from a fossil that dates back to 17,000 BC. Yes a FOSSIL. People have been making rope in some way or another so long that some of it had a chance to settle into soft mud and be turned into stone. 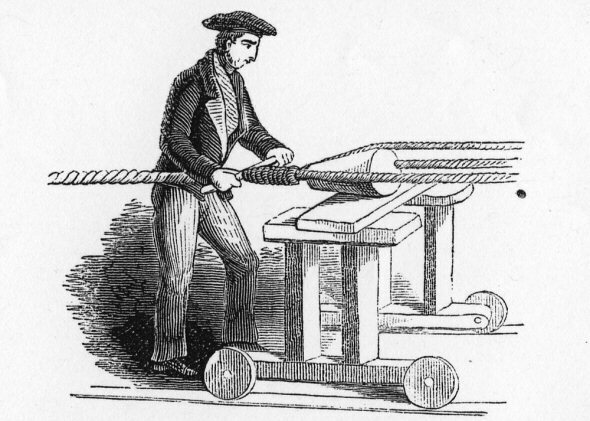 I think we can safely say humans started making rope about 10 minutes after they learned how to use their thumbs. I think we can also safely say that the earliest ropes were braids made from whatever those humans had on hand: leather, animal hair, reeds, etc. The oldest known “real” rope is Egyptian. By “real” I mean rope made by twisting plant fibers into single plies and then twisting those plies into a thick multi-strand cord. 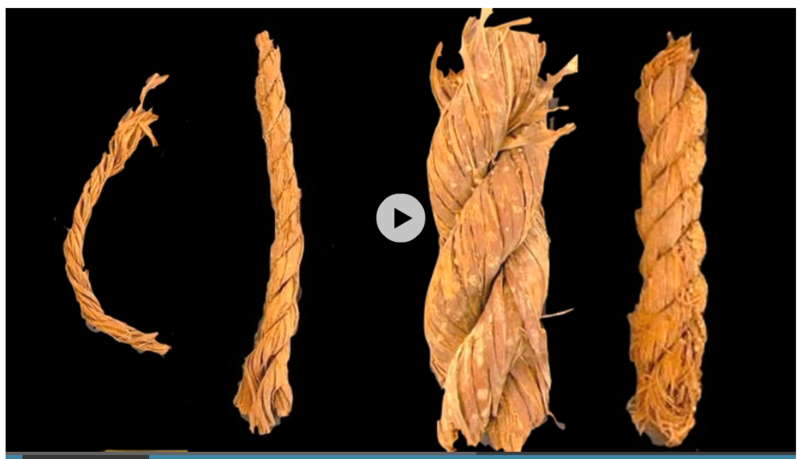 In a cave next to the Red Sea archaeologists have discovered 4000 year old rope. It seems some ancient Egyptian sailors stored their rope, and ship beams, and limestone anchors, in a cave between voyages and then left it all there for us to find. The cave was a perfect vault and the degree of preservation of that rope is amazing. 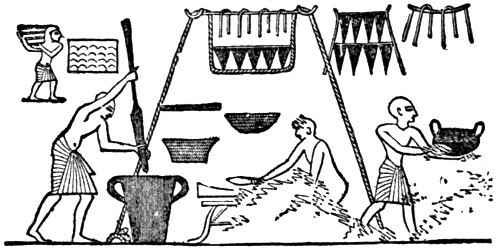 But we knew ancient Egyptians were making rope because we find it in their hieroglyphs. And you don’t think those Egyptian pyramids were built without rope do you? Of course they weren’t. Each block had to be hauled from the quarry, lifted up, and set into position. Lots of rope was needed for that. Lots of very long, very, very strong rope was needed. 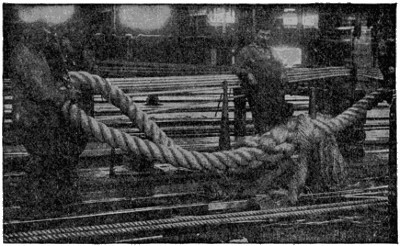 Spliced rope, or rope that is made by joining two or more short lengths into one longer length, would not have been sufficient. Splices are weak spots. In order to build buildings, sail ships, haul rock, and a hundred other tasks people did in the pre-industrial world, you need long, whole lengths of rope. The term cable, or cable length, used to be a specific measurement; 100 fathoms. A fathom is one of those nautical terms that land-lubbers like me have to look up every single time they come across it (1 fathom = 6 feet). So a standard cable of rope was 100 fathoms, or 600 feet. We can think of that as the minimum length of a decent rope. How do you make industrial-grade yarn 600 feet long or longer? You need a rope walk. A rope walk is an area of flat, level ground. Some were outdoors, some were covered like pavilions, and some were actual buildings. The were all long and skinny. All rope was made in a straight line laid out from beginning to end. The length of the rope you could make was determined by the length of your rope walk. FOUND! 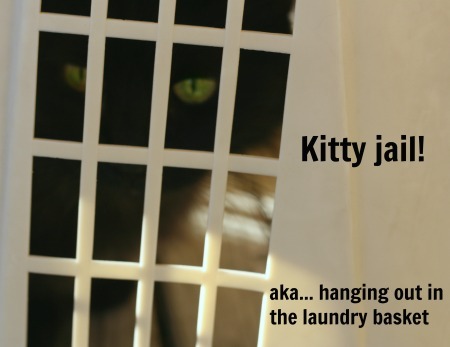 Thanks to Barbara Krooss we the story and a link. Lewis & Clark started out with cruddy rope and it almost ruined everything. The Corps set out early on the morning of June 17, 1804, but came to after only one mile and spent the rest of the day …repairing “cable & tow rope.” …Ten days after leaving that “Rope walk Camp” they stopped again to make rope, this time of elk skin. On August 29 they paused again to make rope out of green—that is, not yet dried—elk hides. On November 23-24 they set up another “Rope works” and made a thick hawser of nine strands of elk skin to draw the keelboat onto the riverbank with a windlass. The lesson there? Animal hide makes for terrible rope. It stretches (as skin tends to do) and then breaks.Use plant fiber! Rope making starts with twisting fiber into a single ply, just like in spinning yarn. Except in rope making the fiber is attached to a big metal hook and that hook is part of a disc or wheel. It was called a rope jack. One man stands at the hook end and turns a crank while a second holds the fiber and walks backwards. The best illustration I could find of this (and it isn’t very good) is shown below. I found it in a homeschooler’s lesson on rope making and no citation for the original source was provided. After the singles were done, they were plied together, just like in spinning yarn. Except the singles were stretched out and tied tight with a carved wooden top set between the strands to hold them apart. The rope maker walks the top backwards slowly while another man turns that crank (in the opposite direction from when he made the singles). 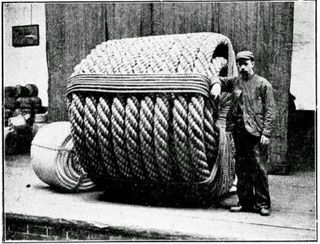 The best rope was compressed as it was plied. A wooden dowel, or bean was held ahead of the top and the single were bunched up, pressed tightly together as they were plied. This made for very hard, very tough cordage. After the rope walk, the rope was tarred to soften it, make it flexible, and weather proof. After the tar was set, rope was coiled up and sold to people who were building bridges, or castles, or sailing around a wooden boats. Those sailors especially needed lots and lots of rope. The HMS Victory, a really grand wooden boat, had 27 miles of rigging. That meant 27 miles of rope was strung up in the air. Of course those sailors had even more rope on hand for strapping down cannons and hauling up water barrels and a hundred other tasks. Then they had even more stored in the holds for when some piece of rope wore out and parted. Industrialization changed rope making of course. Today rope making is a tourist attraction, something done in demonstrations at fair and festivals. 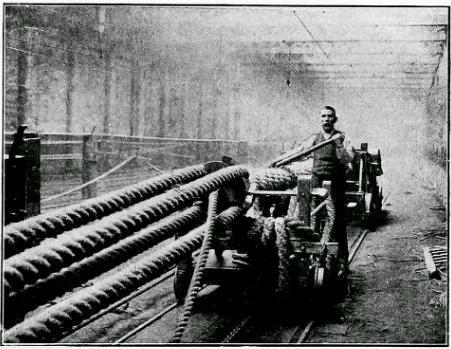 But at one point Boston and Plymouth had 14 rope walks each, all making rope for the naval industry. And at least one large rope walk still in use. Its at the Chatham Dock yard. It was built in 1790 and its over 1000 feet long. Yes, there was a time when rope making was a booming industry and it wasn’t for the wimpy. Because making rope is like spinning yarn on steroids. All but one of the images in this post is a clickable link back to its source. Go nuts! 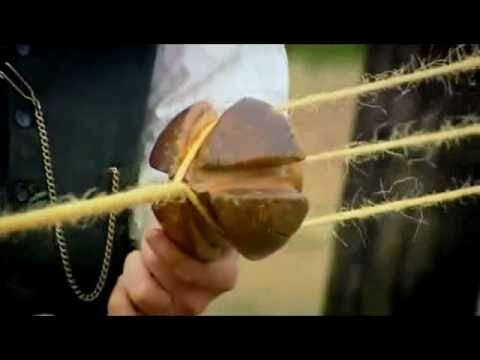 23 Comments on "Yarn Making on Steriods – The History of Rope"
Thank you for today’s smile! Several years ago, we took a Winjammer cruise…ship held 78, including crew. Three masted schooner. Of course I went looking at the rope. Wanted to count plies…first mate asks what I’m doing, he gets excited…”you spin? Show me!” All I had was a tahkli, but we sat. Ten minutes later he’s turning out cotton thread. He’d learn to spin from his mom, had never met another spinner. By the end of the cruise, he’d spun a 24 ply mini rope! Turns out, there was an emergency rope walk in the lowest deck of the ship…. Ha! I can so picture that. You on a romantic cruise adventure giving some young man a spinning lesson while he chats about his mom! We crafters DO KNOW HOW TO HAVE FUN! We also know how to find the other crafters where ever we go. YES! that’s it. That’s the way I remember learning it, lol. They started out with cruddy rope and it almost ruined everything. So they had to stop and make more. I didn’t know that the problem was they used animal skins in place of hemp though. No wonder they had so much trouble! As yes hemp. I was tempted to go off on a ramble about the long and checkered past hemp has played in human society. Maybe someday I will. Go for it, Jenn! I live in Colorado, and one young enterprising farmer here has finally just gotten approval to grow hemp. Took more fussing than the marijuana! More trouble than growing the real stuff? I would express more disbelief but knowing how bureaucracy works… its totally believable. Okay. I’ll put a hemp post on the list with all the other stuff I need to write. Some days I worry that I might run out of topics but… there always seems to be more! You need a trip to the UK Jen! Glad you enjoyed it! I sometimes wonder how forgiving my readers will be when I go off on a weird, obscure topic like this one.